GETLIFTED 2019 was more than a day of inspiring workouts (ahem, did you catch videos of the WERQ session?!) with the best dance fitness instructors from New York to LA. Souls were refreshed. Movement was celebrated. We lived our best life together. There was sweat. There was off-the-charts energy. There were all the feelings. And there was swag. Lifeway provided delicious Kefir — a probiotic-rich smoothie that is more nutritional than yogurt, and a great (easy!) way to start the day. Bulletproof spent the day with us and festival goers couldn’t get enough of their cold brew coffee and protein bars. Their products make it easier to reach your highest state of performance, so you can do more of what you love. It was obvious that festival goers loved dancing, and they loved Bulletproof for keeping them charged up all day long. When it was time for FUEL, Eat Clean Chicago delivered! Eat Clean Chicago invites you to live smart and eat healthy with their fully prepped ready to eat meals handcrafted by chefs with locally sourced vegetables, hand-trimmed FDA-approved meats, and whole grains delivered to your door. It’s meal planning made easy. Festival goers got to sample some of their offerings for lunch. The verdict? Yum! Zermodus, the maker of the everyday visionary planner (a 12-week undated daily planner to help bring your vision to life), helped us take notes during the GETLIFTED keynote session with Jenn Dieas. Because it’s always a good idea to jot down the things that inspire you to reach your goals. Petal quenched our thirst with their delicious sparkling botanical blends and flower-powered goodness. We raised our Petal cans and our vibes at GL3. Elixicure is an all-natural alternative to standard over-the-counter pain relief meds. Their formulas are plant-based and fast-acting. Festival goers received pain relieving lotion to soothe tired dancing legs. Brode Electrolyte Vitamins can be taken anytime, anywhere, with any drink. They’re like a sports drink that has been reinvented as a multi-vitamin. Everyone at GL3 took home a pack of their own. La Cle is the maker of the seriously cool focus bands received by each festival goer. La Cle’s action-based apparel (translation: wearable inspo!) helps you look good, feel good, and do good. Lolë believes wellness is a lifestyle (and we agree!). Their activewear is modern, mindful and meaningful — made to move with you. Festival-goers each took home an awesome reusable tote in the brands signature yellow color. It’s still cold outside, but festival-goers are ready for the summer sun thanks to the sunblock we received from Coola Suncare. Coola is passionate about making healthy, clean suncare products people love to wear. Festival-goers could be seen chatting with friends old and new between Sweat Sessions while snacking on Junkless Granola Bars. Junkless is committed to getting rid of the junk — better treats that are simple and real. No fake stuff added. We were committed to finishing every last bite of the bars found in our swag bags. We are pretty sure the Emmy’s Organics Coconut Cookies with Chocolate Chips included in the swag bags never made it all the way home with festival goers. These gluten-free, vegan and organic superfood snacks were just begging to be enjoyed right away. When I dip, you dip, we dip… and that’s what Gnarly Pepper is all about. Mix their custom spice blends with plain Greek Yogurt to create guilt-free condiments and dip. Festival goers took home samples to try at home. GETLIFTED 2019 may be over, but the fun doesn’t stop here! Attended and want some more swag? Or maybe you missed out on this year’s event and are coveting that official 2019 #GETLIFTED cinch bag? You’re in luck! We’re giving away 5 swag bags with cool stuff from some of our sponsors, AND we’re giving away 5 official 2019 #GETLIFTED tees! That’s ten winners and you could be one! CLICK HERE TO ENTER. 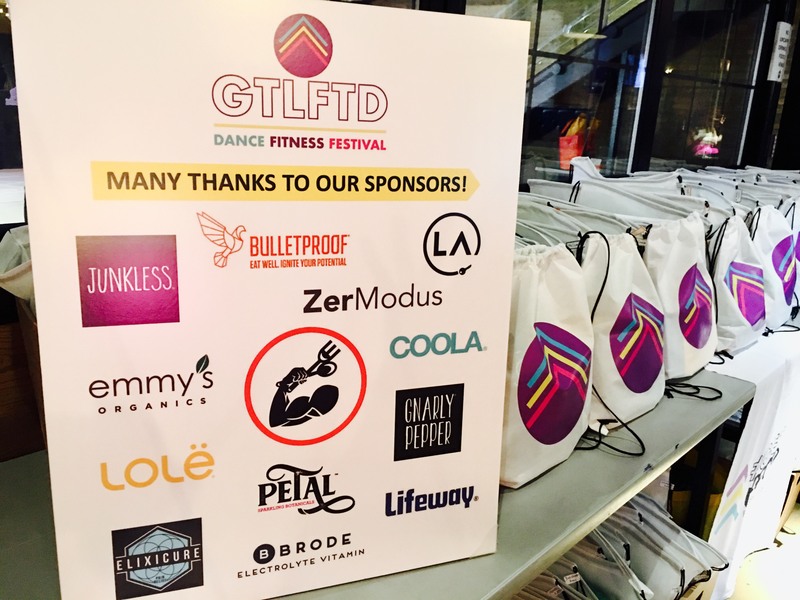 A huge GETLIFTED thank you to all of our sponsors for their support!